Editor’s Note: Greetings! Welcome to the first in a four-part series here on The Middle Spaces—co-organized and co-edited by Joshua Kopin—focusing on sound and comics (or sound in comics). It is a round table featuring 15 different scholars exploring different elements of how sound is represented, put to use, and imagined in the comics medium and through a bunch of different genres. Full bios for all our contributors can be found on the Guest Writers page. In the October 24, 1896 edition of Joseph Pulitzer’s New York World newspaper, cartoonist R.F. 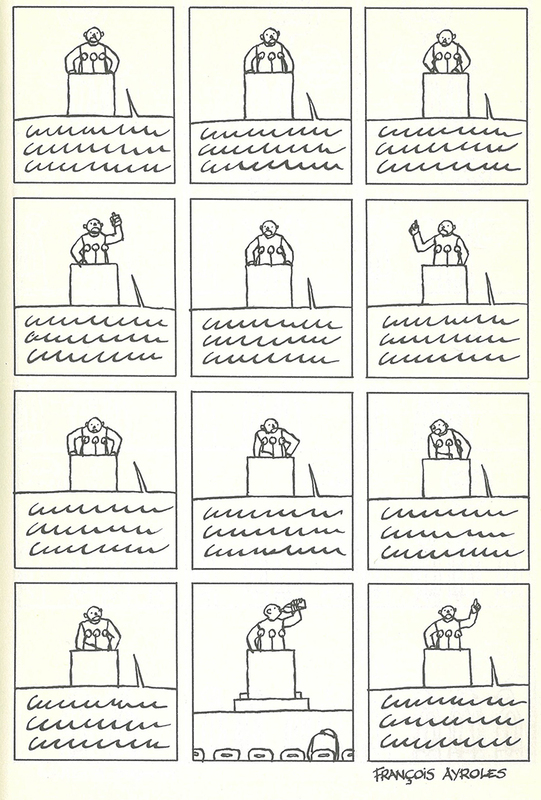 Outcault sounded out some developing strategies for representing noise in sequential cartooning. 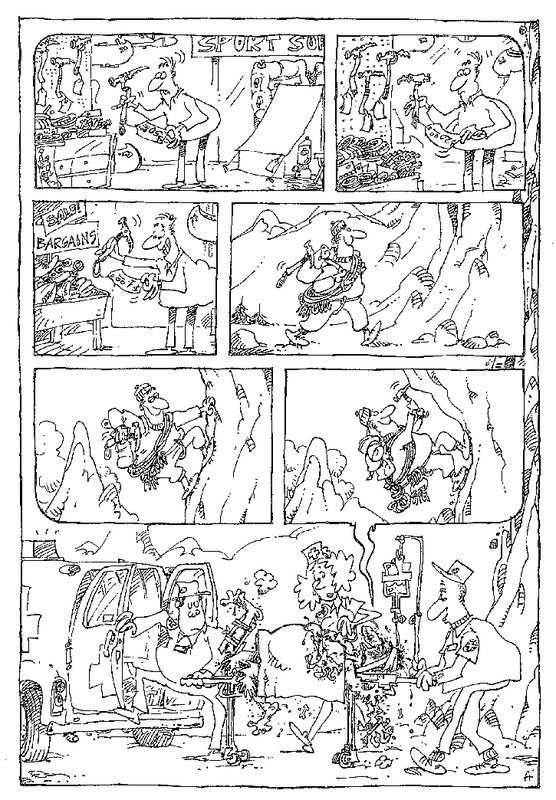 Although his extraordinarily popular Hogan’s Alley illustrations for the World were usually produced as extremely rich, detailed and chaotic half- or full-page tableaus, this episode is markedly different because it is composed of five images that march forward in sequence; what we would now call a comic strip. 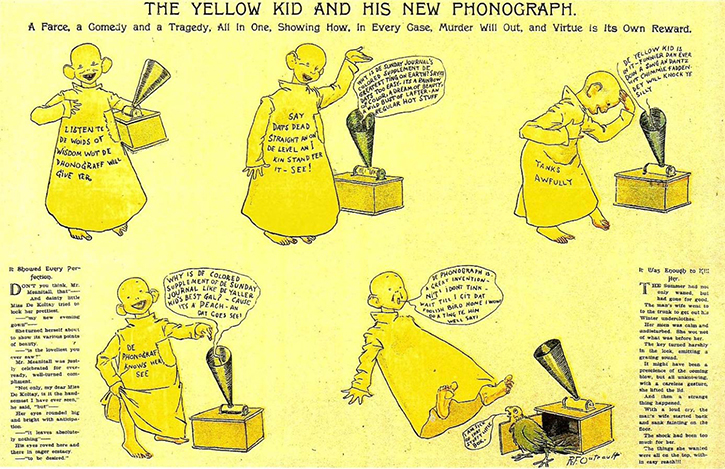 In the five panels of the strip, titled “The Yellow Kid and His New Phonograph,” Outcault’s famous street urchin admonishes the reader to “listen to de woids of wisdom wot de phonograff will give yer” and then carries on a conversation with the machine, a kind of dance to the tune of mechanical reproduction. In the middle three panels, the phonograph compliments its owner and the World with word balloons, the wispy tail of which disappears down its long, straight horn. The Kid, meanwhile, responds via captions that materialize on his shirt, accepting compliment after compliment, glowing with each new praise. Finally, though, in the fifth panel, something extraordinary happens: Hogan’s Alley’s resident parrot emerges from the phonograph’s chest, announcing “I am sick of that stuffy little box.” The Kid, in a state of shock, hangs in the air, buoyed by his own, brand new word balloon. The frisson of surprise has not only knocked him off his feet, it has driven the words off of his shirt and into the air, transmuted, like the phonograph itself, mechanically reproduced data into sound (or, at minimum, the representation of sound). Sometimes “The Yellow Kid and His New Phonograph” gets called the “first comic strip.” There are a variety of reasons that that label seems misplaced, not least of which is that the word balloon is a formal labeling strategy in illustration that stretches back hundreds of years before Outcault first picked up his pen, even appearing in several of his earlier tableaus. What we can say definitively, though, is that it is around this time that the presence (or absence) of sound becomes a defining characteristic of the emerging comic strip and that what had been a silent medium, now sounded, could only get louder. This round table features fifteen extraordinary scholars at various stages in their careers investigating the variety of ways that comics sound and, equally importantly, how they might be silent. They ask questions about how music can be represented, about how comics can make noise outside of the strictures of sound effects and the word balloon, about how the word balloon might itself be flexible, and about how all of these questions can be translated across culture and language. They find that these questions are not only formal but also political, that comics are cacophonous, that they have rhythm and harmony, that they make noise that demands our attention. Let’s listen to them together. How do silent comics use sound? Barbara Postema, Senior Lecturer in English at Massey University in New Zealand. Silent comics draw attention to the conventions of the form by breaking with a number of formal expectations. They don’t portray the frequently-used-as-definitive aspect of comics, its hybrid use of words and pictures. Further, wordless or silent comics are not actually silent, of course. They are silent in the way silent movies are silent: they are wordless. You don’t hear the dialogue (or in this case, you don’t read it), but you could still see people shouting at each other or glass breaking. Many wordless comics play up the paradox of their formal qualities by incorporating it in their titles. In a way, all comics are silent – they never produce audible sound – but wordless comics elevate the absence of certain kinds of communication, particularly talking, by referencing it in their titles. Examples include, Louder than Words by Sergio Aragonés (1998), Peter Kuper’s Speechless (2001), Almost Silent by Jason (2009), and George Walker’s The Wordless Leonard Cohen Songbook (2014). Other titles play with (aspects of) sound as a theme: Blood Song: A Silent Ballad by Eric Drooker (2002), Les Parleurs by François Ayroles (2003), In the Sounds and Seas by Marnie Galloway (2016), and Sound of Snow Falling by Maggie Umber (2017). These works are self-consciously silent, and navigate their wordlessness in different ways. None of the worlds represented in the comics listed above are worlds without sound, so in all of these comics, sound is captured in ways beyond the standard word balloons and sound effects. Some of these works use balloons, but fill them with things other than words. Ayroles uses word balloons filled with squiggles to represent speech in a series of short gag comics. They all deal with the oddities of conversation, but also often play with the conventions of form. In one strip, a speaker is shown at a lectern, giving a rousing speech across ten panels where the bottom half of each panel is filled with his speech balloon. In the eleventh panel he pauses to take a drink. With this temporary silence his speech balloon disappears and the bottom of the panel reveals rows of empty seats, with a single audience member sagging in sleep. This scene is then covered up again as the speech resumes, providing a visual gag about sound and silence. Aragonés does more straightforward wordless gag strips for his series Louder than Words, where he plays with the potential of pantomime, as well as the possibilities that balloons offer beyond the containment of text. He regularly uses speech and thought balloons filled with images to communicate what characters are saying or thinking, a common occurrence in wordless comics. But in a number of strips he also uses the balloon in a metanarrative way, where in the final panel the reader sees that the previous panels were contained in a single large speech balloon, making these panels into a narrative told by a character in the final panel, as they explain how they got in their current situation. He uses this format repeatedly, to show for example a mountaineer telling his ambulance crew how he fell (he bought discount gear and then went climbing). These single-page strips are revealed to be flashbacks, using visual means to establish a narrator and the act of narration in retrospect. With their titles and visuals, Galloway and Umber both make sound something readers are continually aware of in their silent comics. Galloway uses blank balloons to show speech. These empty balloons are a carefully composed element of their panels, making the conversation a central part of the visual narrative without letting readers be privy to what is being said. The narrative begins and ends with voices raised in song, indicated first by the position of the characters’ mouths, throats and heads. Then the three singing voices are visualized as strands of sound, each with its own character and pattern, entwining and rising into the air and filling the pages as waves of sound. Synesthetically, this gives a powerful representation of song and harmony, and becomes a pattern that is repeated throughout the work. With the almost paradoxical title Sound of Snow Falling, Umber reminds readers of the vaunted silence of owl’s wings (perhaps they are even more quiet than falling snow, which can make a tiny rustling/tinkling sound). In images that capture the dim half-light of dusk and moonlit nights, the owls are almost-abstract apparitions that sometimes take a moment to find on the page, as if the eye needs to adjust. Contrasted with the owls are other animals in more vibrant colors—louder colors that suggest the noisier behaviors of woodpeckers, squabbling ducks, and scurrying raccoons. The tones and intensities of the colors in this comic work to capture the natural lives of these animals. This includes the sounds they make—muted colors are muffled sounds, bright colors are clear sounds—which readers are primed to attend to due to the title of the work. Comics never directly create sound, but they can convey it in myriad visual ways if readers have the eyes to listen, and wordless comics highlight this. How do techniques from comics narratives of deafness create a sense of disorientation and potential alienation that reveal the role of sound in graphic medicine? In El Deafo by Cece Bell the uncalibrated hearing aid turns all the words reaching Cece into an undifferentiated background of noise. Recently, greater attention has been given to the experiences of the deaf and hard of hearing in comics, from Kay and Matt Daigle’s That Deaf Guy to the works of Carlisle Robinson. In their article for Inks: The Journal of the Comics Studies Society, Dale Jacobs and Jay Dolmage observe that comics have “gained new rhetorical tools, more accessible articulations” in their portrayals of deafness and the resulting reader experiences (361). Garbled, empty, or obscured word balloons are “meant for the reader to experience the inconvenience of an inaccessible world” (364), partly, in Jacobs and Dolmage’s reading of the series Hawkeye, towards “the realization of human interdependence” (365). 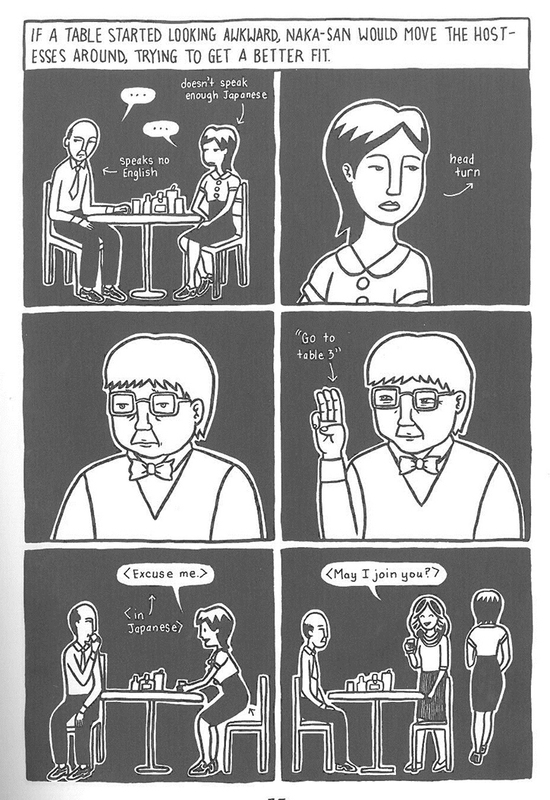 Writing for Children’s Literature and Education, Sara Kersten recounts that her own experience of teaching Cece Bell’s El Deafo in her college-level class adds to this direction for comics in “that it invited the students to explore and have conversations about marginalized and inaccessible subjects” (283). Not only is there a growth in empathy by readers of these works but also an enhanced ability to inhabit experiences well outside their own social spheres. These rhetorical innovations for deafness in comics are also present in the depiction of other medical scenarios, specifically the traumatic initial effect of a cancer diagnosis. Numerous cancer comics feature that moment of terrible discovery, “the scene in the doctor’s office [that] has become canonical in stories of disability,” says Kersten (357). This is not to conflate deafness with cancer nor define the illness as a disability necessarily, but to note that the same comics techniques that expose the hearing reader to the experience of the hearing-impaired character can fulfill a similar function for expressing the disorientation and renegotiated identity of the cancer patient. That “canonical” scene disorientation can be expressed, through visual rhetorics of deafness and in terms of cancer diagnoses, in more than one way. 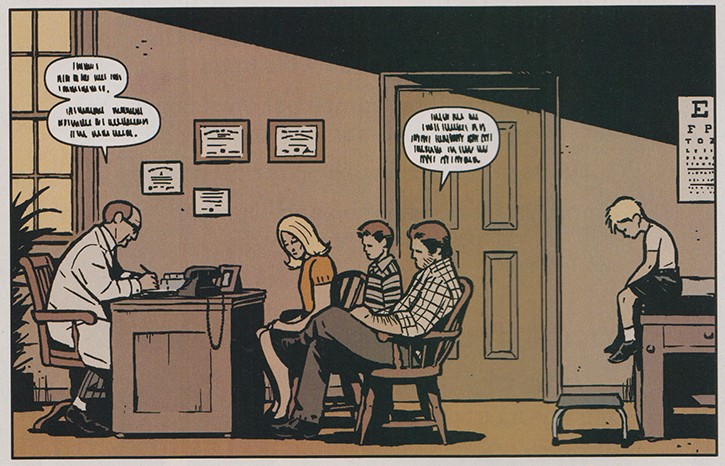 Matt Fraction, David Aja, Matt Hollingsworth, and Chris Eliopoulos feature a pair of doctor’s office scenes in Hawkeye #19: one with young Clint Barton experiencing inner and middle ear damage during his childhood and another where the grown adventurer suffers total hearing loss from an injury. In the former, his parents and the doctor are apparently discussing his condition, but all Clint and the reader can make out in their word balloons are a series of indistinct dashes. (Longtime comics readers might liken the markings to the indecipherable chirpings of Woodstock from Charles Schulz’s Peanuts.) 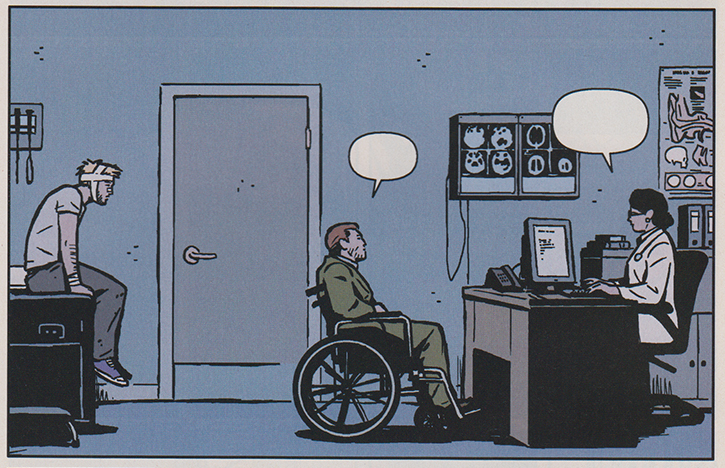 Noise is being represented, and, given the encapsulation in word balloons, it should be understood as speech, but, in his condition, Clint cannot decipher it. In the latter scene, a discussion seems to be taking place between Clint’s brother Barney and the doctor, but the word balloons are entirely without any content or markings. The deafness communicated here is far more profound, with no sound heard. 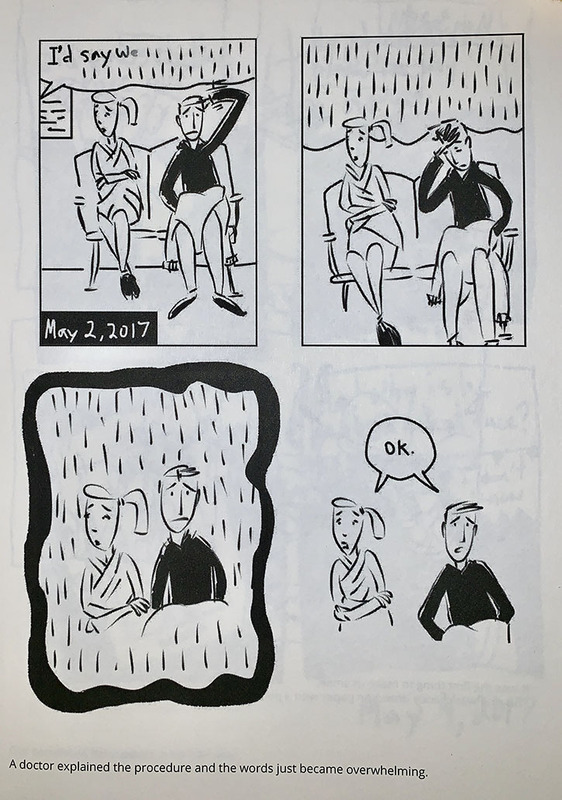 Similar to young Clint’s experience, in Then This Happened…: A Diary about Breast Cancer Tom Ray has an off-panel doctor’s words devolve into streaked lines to convey how “overwhelming” the diagnosis of breast cancer was for him and his wife Merijoy. By the third panel, the streaks are no longer contained by a word balloon and, instead, fill almost the entirety of Tom and Merijoy’s environment, like raindrops. Though the doctor’s speech, as drawn, has no meaning, the fact that he is speaking and that they are there to receive the inchoate information communicates its own powerful message: Her cancer diagnosis threatens to overtake their lives, to carry them away from their world of the familiar. 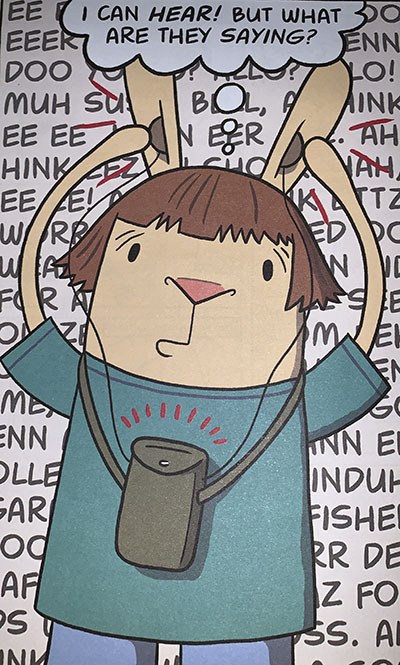 Cece in El Deafo is depicted–like adult Clint Barton — as being unable to hear via empty word balloons. However, even when equipped with hearing assistance, the uncalibrated device turns all the words reaching Cece into an undifferentiated background of noise. Her thought balloon remains clear and coherent to the reader, just as the thoughts themselves are to Cece, so readers experience the contrast in Cece’s auditory world as she does. This parallels a scene in Mom’s Cancer, where Brian Fies and his family discuss the diagnosis, and his Mom does not seem to fully understand the situation. “Why isn’t Mom getting any of this? She’s weak, confused. […] Shuffling. Listless. Dazed.” The narrative depicts Mom as drowning in a sea of words which fill the entirety of the background. If not meaningless, they at the very least lose their coherent meaning and visually suggest a feeling of drifting. The effect is not quite as immediate for readers as with Cece, since Fies is the focalizer of his mother’s story, while Bell is relating her own autobiographical experience. Nevertheless, neither Cece nor Mom can process the stream of language besetting them, and Bell and Fies have reworked their verbal modality into spatial ones to convey this lack of hearing. Again, deafness is not cancer, obviously, but the matter here is not the medical condition but the methods of expressing it. The visual rhetoric that has been devised in comics for representations of deafness have important additional functions in Graphic Medicine: These innovations invite readers without experiences of diagnosis closer to the genuine alienation, temporary or otherwise that they bring. Comics, and Graphic Medicine in particular, “give voice to those who are often not heard,” says MK Czerwiec (2); conversely, it also can powerfully communicate the trial of being unable to hear. How can comics depict linguistic differences as critical markers of identity? Francesca Lyn, doctoral candidate in Media, Art & Text at Virginia Commonwealth University in Richmond, Virginia. In answering this question I look at how the speech bubble functions as a manifestation of the sonic and how this form is used in MariNaomi’s Turning Japanese (2016). Turning Japanese is an autobiographical comic centered on the cartoonist’s experiences working in Japanese-style hostess bars during the 1990s. Language plays an integral role in MariNaomi’s process of self-discovery as a mixed-race Japanese woman. Comics are a particularly poignant medium to depict these themes as speech and language take physical form. The physicality of the speech balloon links them to the body, further aligning language as an embodied practice. The speech balloon functions upon multiple, simultaneous planes of meaning, representing sound as a convergence of breath and speech. Comics use many distinct forms to represent language and speech differences. The speech balloon is a familiar convention used in many comics and can convey information about the speaker. The balloons can imply a different way of speaking depending on how the text is presented or how the balloon is shaped. For example, George Herriman’s Krazy Kat represented the idiosyncratic speech of its characters using phonetic spellings and invented words. Billy DeBeck’s comic strip Barney Google and Snuffy Smith represented the distinctive Appalachian vernacular of the titular Snuffy Smith with phonetic approximations of an exaggerated hillbilly accent. Other comics use stylized lettering to indicate characters speak with an accent or have distinct speech patterns. In Archie Comics’ Josie and the Pussycats the character of Melody speaks in a sing-song voice which is denoted by the use of musical notes in her word balloons. Comics can also depict the insufficiency of language and moments that may be lost in translation. The space opera comic series Saga, created by writer Brian K. Vaughan and artist Fiona Staples, centers on Marko and Alana who, despite belonging to warring factions, fall in love. Alana, a native to the planet Landfall speaks Language, which is represented with black text. Marko, who is from Wreath, speaks the native language which is called Blue. Blue is rendered in blue text and sometimes represented with Esperanto. The use of two languages emphasizes the differences between the two main characters, providing a visual metaphor for how their relationship bridges a linguistic gap. Within Turning Japanese, MariNaomi uses a wide range of strategies to represent differences in speech and language. MariNaomi mostly renders her text in small, neat handwritten print. When representing a character is speaking a different language or using words not understood by the listener, these words are displayed in translation for the reader and surrounded by angle brackets. Mari’s first hostessing job is at a bar in California where the clientele is mostly Asian businessmen. In one six-panel sequence she speaks to a man who does not speak English. In the first panel of this sequence she represents their conversation as speech bubbles with a series of dots in them. The conversation is annotated within the panel with arrows leading to explanatory text indicating the two cannot sufficiently understand each other. In the next panel she is depicted looking off to the side, indicating her attention is directed at someone else. The third panel depicts the manager of the bar with a pensive expression. In the next panel the manager smiles and holds up three fingers, indicating she should move to table three. In the fifth panel Mari excuses herself from the table. Her speech is bracketed, indicating she is speaking Japanese. The last panel shows another hostess, presumably one who speaks more Japanese, joining the customer. Thus, MariNaomi depicts the multiplicitous possibilities of a language and the difficulty of language acquisition using both visual and verbal cues. In addition to the examples in the previous sequence, MariNaomi also presents some phonetic transliteration of Japanese words or phrases, giving the reader some idea of what the language sounds like. These transliterations are sometimes translated in English at the bottom of the page or panel. Occasionally, spoken Japanese is represented by gibberish characters indicating that Mari does not know what the speaker is saying. Language is a complicated and critical part of MariNaomi’s identity. Conceptualizing the speech bubble as an extension of the body helps us understand the connection between speech and identity, allowing us to probe language’s insufficiency. Throughout Turning Japanese, Mari’s mother remains resistant to speaking Japanese with her daughter, never giving her daughter a satisfying reason as to why she is unwilling. It is not until Mari learns more Japanese that she realizes how much work is involved in acting as a translator which gives her some insight on why her mother was unwilling to facilitate conversations. In the end, this autobiographical work relies on the vocabulary of comics in order to honor the difficulty of acquiring a language. Moreover the use of the comics form allows for the articulation of a marginalized position and the exploration of intersectional identity through lived experience. How does silence produce sounds in comics? Emmanuel Guibert’s La Guerre d’Alan (Alan’s War, 2000) offers a surprising view on the many possibilities of picturing sounds in comics. In Guibert’s La Guerre d’Alan #1, an account of Alan Ingram Cope’s experience as a soldier in WWII, sounds and noises are treated in an extremely sober fashion. Onomatopoeias are used on very few occasions. For instance, on two pages the action of shooting a weapon provokes a “PAH”, but even this sound is written in standard printed type, eliminating therefore the onomatopoeia’s expressive dimension. Noises such as rifle gunfire seldom occur as the protagonist Alan is, anyway, scarcely involved in direct war actions. He exists in a rather silent world, fitting for the understated tone of the narrative: Cars, tanks, water pouring down the shower don’t ‘make’ noises, and even the storm at the end of La Guerre d’Alan #1 doesn’t ‘howl.’ These silences are designed to open a space for the voice of the first-person narrator Alan, mostly deploying in the form of handwritten captions. One sequence in particular is most striking concerning the graphical treatment of music, which has an important place in Alan’s life. He discovers classical music during his training at Fort Knox, which, as he states, represents a ‘turning point in his life’ (49). Merely by chance, Alan enters a hidden club room dedicated to music. Here, soldiers could listen to a collection of music and also play the piano. In this central sequence, not a single musical note is represented. Guibert suggests the music through the graphic composition, by relating different elements which evoke, on the one hand, density and (graphic) noise and, on the other hand, musicality through a regulated, harmonic distribution. The sequence starts with a half-page panel featuring a crowded hall (49), where soldiers are gathering, playing, (supposedly) shouting. The dense composition gives a sense of deconstruction, of loose elements circulating. 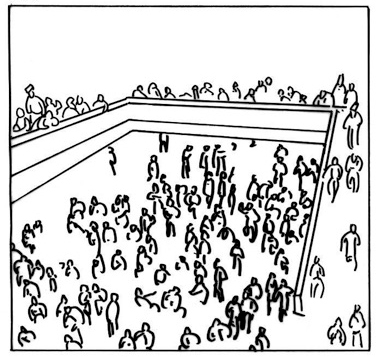 The protagonist melts into a crowd of people of equal shape moving in an optically flattened space. Although there is not a single onomatopoeia or speech bubble, the reader still gets a sense of noise because of the crowded figures in the large space of the hall. In the next two panels of the page, Alan pushes open an unknown door. The crucial moment of discovery is revealed on the next page (50): The “world of beautiful music” (as Alan terms it) is the graphic opposite of the previous entertainment hall. It is characterized by a harmonic structure, where the graphic elements find themselves well distributed and well differentiated. The space gives a sense of depth, the few protagonists are clear-cut and involved in different, recognizable activities. The image produces an impression of calm, which is highlighted by the absence of any speech – even the voiceover has stopped. At the same time, the room should be, as becomes clear through the verbal description of the place, filled with the sound of music. Nevertheless, the music is only suggested through harmonic composition and the depiction of some LPs, such as Franz Schubert’s Death and the Maiden (51). It resounds merely in the imagination of the reader, according to the evocation of a distant memory. Like many other authors of the Parisian publishing house L’Association, in La Guerre d’Alan Guibert eschews the traditional graphic repertoire of Franco-Belgian comics (also known as Bande Dessinee or BD). In classical comic albums, such as Hergé’s Les Bijoux de la Castafiore (The Castafiore Emerald, 1961-62), music is represented as a musical score and as onomatopoeias, in a yellow-colored caption scrolled out above the panels (21). The score itself is composed of a musical notation which signify the piano playing and, next to each piano note, a repeated “ha” which renders the voice of the singer Castafiore, repeating each tone given by the instrument. The emphasis lies on the expressive qualities of the onomatopoeias and the musical score, underlining Castafiore’s more or less disharmonic attempts to sing the right tone. A false tone is pictured through a shaky note, and the shaky singer’s “ha” finally turns into pictographic signs denoting swear words before she resumes her repetition. Distinction and structure of the figures provides a different sense of sound in this panel. In Emmanuel Guibert’s La Guerre d’Alan, music is, paradoxically, produced by its absence. This underlines the narrative’s aesthetics which functions primarily with ‘gaps’ in Barbara Postema’s sense (see her Narrative Structure in Comics, 2013 ), meaning that gaps and absences operate in comics as a main signifying unit at different levels. They ask to be ‘read’ just like the visible elements. The beauty and calm of classical music is thus embodied through a sober graphic composition relating different, contrasting elements (noise/music, harmony/disharmony, density/clarity). Musical forms are suggested by means which do not rely on the traditional graphic repertoire of the classical BD album, but rather on understatement and discretion. We encourage readers to contribute comments and questions below and to come back in two days for part two of our round table when three more scholars will explore a question about the intersections of comics and sound, this time with a focus on music. If you want to see more comic studies content like this and others please consider signing up for our Patreon for as little as one dollar a month. Alternatively, you can make a one-time donation using ko-fi.